Marguerite Davol wrote in 2008: “I grew up in Illinois, but consider myself a New Englander. South Hadley, Massachusetts, has been home since 1960, with summers in New Hampshire. I’ve lived two years in England and traveled extensively in Europe, China, India, and the Americas. Most memorable? Facing polar bears in the Arctic. Walking with penguins in Antarctica. My family includes three children, four grandchildren, and a great grandson. In 1992 I married Robert Greenberg and acquired three more children and three grandchildren. “I am the author of seven picture books that are original folk, pourquoi, and tall tales, as well as a collection of original tall tales for all ages. Best known is The Paper Dragon, given two SCBWI Golden Kite awards, one for my story and one for Robert Sabuda’s illustrations. An eighth picture book, Black White, Just Right, was written because I have two black, white grandchildren from an interracial marriage. “Did I always want to be a writer? No. But like most writers, I wanted to read! Hidden away in an apple tree or our attic, I read the few books available at home – from ghastly Victorian moral treatises to comics. After I exhausted the children’s book section of my small-town library, I devoured shelves of mysteries, romances, pop-psychology – anything – and met many good books along the way, of course. “How did I become a writer? My teaching young children at Mt. Holyoke College’s lab school was a long and happy apprenticeship for writing children’s books. Immersed in good picture books, I learned what appealed to children – the rhythm of the language, the illustrations, the story itself. Influential, too, was the world of storytellers. Fascinated by their tales, I became a storyteller. However, rather than retell the old tales, I made up my own stories. Most of my books began as tales that I created to tell to children; subsequently these oral tales were shaped into books. 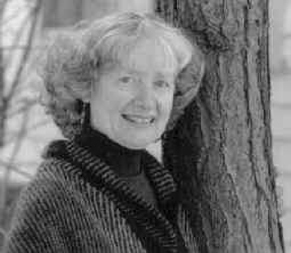 Marguerite W. Davol passed away in 2012.